One Chinese appetizer that remains popular year after year is crab rangoon. The sweet, delicate flavor of crab and the crunchy texture of deep-fried wonton make for an intriguing combination. The four basic ingredients in crab rangoon are crab meat, cream cheese, green/spring onions, and wonton wrappers. From there, the only limit is your imagination. Even these four ingredients aren't cast in stone. For example, you can use egg roll wrappers in place of wonton wrappers, or substitute cilantro for the green onion. Worcestershire sauce, a popular seafood enhancer with its unique mix of tamarind, dark soy sauce, and vinegar, is found in many crab rangoon recipes. Another popular flavor combination is sesame oil and dark soy sauce. Many recipes call for fresh garlic or, more rarely, fresh ginger. Traditionally, crab rangoon is deep-fried. 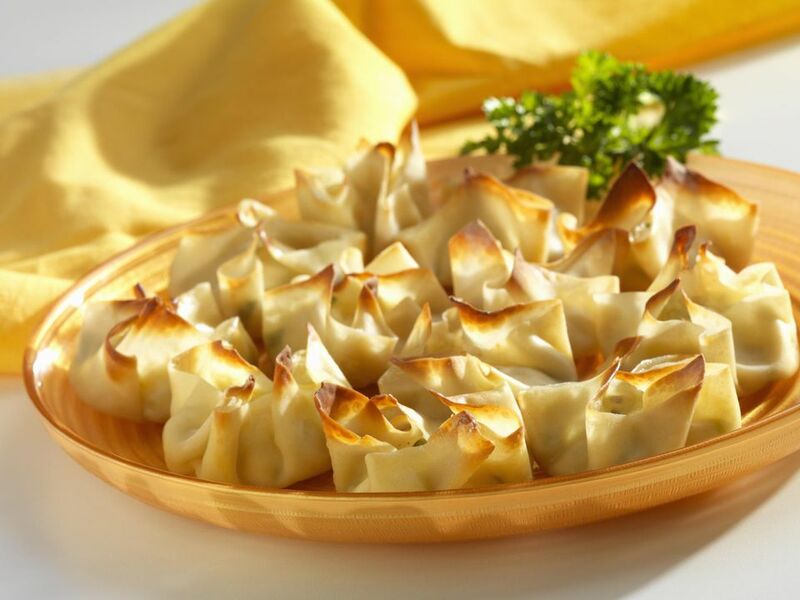 However, if the thought of being near large quantities of hot oil makes you nervous, another option is to bake the filled wontons on a nonstick baking sheet in a 425-F oven for about 12 minutes or until they are golden brown. Brush the tops with sesame oil before baking to encourage browning. Another way to forego frying is to bake the filling and serve it as a dip on wonton "chips." Finally, there is the matter of a dipping sauce. The sharp bite of Chinese hot mustard works well with crab rangoon. Sweet and sour sauce is good as well. Use fresh-cooked crab meat if possible. If using canned crabmeat, drain and flake first. Also, remember to work with the drained weight of the crab meat when figuring out the amount to use. Most recipes have a slightly higher ratio of cream cheese to crabmeat, but it all comes down to how "cheesy" you like your crab rangoon. Make sure the cream cheese is at room temperature before using. If the filling is leaking out of the wrapper, try sealing the wonton with egg white or a water/cornstarch mixture instead of plain water. Some crab rangoon recipes include Chinese vegetables such as bok choy and water chestnuts. Go sparingly on the extras—less is more. Here's a good crab rangoon recipe to start with. Many people don't realize that, despite having the capital city of Burma in its name, crab rangoon isn't an Asian recipe. While its exact origins are difficult to trace, it may be the creation of a chef at Trader Vic's, a restaurant chain started by "Trader Vic" Bergeron that became famous for its Polynesian cuisine in the 1950s. In any event, today crab rangoon (occasionally misspelled as crab ragoon) is very popular, particularly in eastern states and the Midwest. Here is the Trader Vic's crab rangoon recipe.